My new love, oh no, I mean have felt in love with a new media player. PotPlayer is not new, but being outdated uncle, I was too lazy to change the media player once I found it is very stable for daily usage. I have been using KMPlayer for many years, with Media Player Classic as backup for daily usage. PotPlayer is created by the same author (Mr Kang) that wrote KMPlayer. However KMPlayer has been sold to a commercial company, Pandora TV in 2007. After that, Mr Kang shifted his focus to create another player, hence PotPlayer is created. Why I switch from KMPlayer to PotPlayer? 1. PotPlayer has the same functionality like KMPLayer. Therefore no problem at all from the time I switched. 2. KMPlayer is becoming bulky after being takeover by Pandora TV. It is not as light as I think anymore. From the setup file grow from ~14M at Sep 2010, to ~17M at Oct 2011, to ~22M for latest version of KMP 3.1. This is a very bad sign, the code should be optimized from time to time, but becoming another MS Windows. PotPlayer at softpedia right now is about ~8M only. 3. KMPlayer become slow in sync up the video and audio during play back of RMVB format. The problem appear when I try to skip to a certain time, or fast-forward or backward, especially I use the left and right arrow keys to fast-forward or backward. PotPlayer don't have this problem at all. Media Player Classic don't have this problem as well. 4. Portable version of PotPlayer is easily available compare to KMPlayer. 5. No additional codec is require to enable PotPlayer to play all major format. I don't need to install any codec to play RMVB, mkv, divx, xvid, etc etc. 1. Original website is in Korean only, no other language. We also cannot feedback in it's forum if we found any bug if we don't know Korean language. However you can find the English version from softpedia. 2. I downloaded portable version from a Chinese website, that PotPlayer is completely in Chinese only. Not as friendly as KMPlayer that I can switch language on the fly. Summary, more advantage than disadvantage using PotPlayer. I am going to remove KMPlayer from my computer in very near future. Lifehacker even has feature this player. p/s: contact me at ahsiang888 at google mail for software review. Which file sharing server still working? With megaupload being shutdown, some file sharing server owners also shutting down and limiting the file sharing features, to avoid being arrest by authority. Personally I use file server a lot because I like to download files being shared in XDA forum to make my smartphone even better than stock ROM. These kind of file sharing activities are completely legal (unless commercial companies uses SOPA and PIPA to suppress this kind of creativity, if SOPA and PIPA being approved by US Senate). Btw, XDA forum don't allow cracked apps (that supposed need to be pay in market/app store), therefore I think files shared in XDA forum is legal to download and use. I listed down a list of file server that is working and non-working one just for reference. Please leave a comment if you found any of the info is outdated, I will try by best to update it. Note: please make sure it is legal to download the files that being shared in any forum. Yes, another waste time post for 2012 CNY. How do boots and cats hold up to each other? Watch the video. I am still in CNY mode. In fact I am still in holiday. Therefore, I should continue posting waste time posts until I recover from holiday mode. Heheh. Okay, for waste time post for today. Someone put up a website to show people how much video being uploaded to YouTube every second. While the video embedded in this post has its interesting facts, overdoing it in their website is really over doing it. Don't believe me? Click on the link after the video. I subscribed to many newsletter, from IT to finance, just to improve my knowledge, hopefully. Recently I received invitation email to invest in some investment scheme. Undeniable that scheme is very interesting and the return is very good, but I am skeptical even thought it is through a very reliable website. So I did some google-ing. Unfortunately or fortunately for the scheme (and the owner), I can't find any information regarding the scheme on the internet, except the company website. Hopefully is a legitimate scheme. Good luck to those invested in the scheme. While doing the research on the scheme, I found a interesting website. It is called Money Laundering and Reshipping Fraud, however the link is bobbear.co.uk. No body would know the content with the link name, anyway. bobbear.co.uk is a voluntary, non-profit website that dedicated to provide information on fake companies offering part-time, work from home job scams, money mule or money transfer fraud. The website also provide advice from the victim of these mentioned scams. Even though the website looks like not updated since 2nd May 2010, it is still a very good reference. Those people that creating those kind of scam cannot be too creative enough, similar scams are always being created, it might be different name, but the ultimate goal is to cheat hard-earn money. Please do some research on internet before you invest in anything. For those that back to work on 3rd day of CNY, "Welcome back to work!" But are you sure you can really concentrate at work? Are you the only person in the office? Fear not, here is a song to keep you entertained. zapatou user of youtube created this video, covering 71 clips of people singing "Rolling In The Deep" by Adele. Enjoy the song now. If SOPA is being approve by US Senate, you will have a super boring Internet. Enjoy it while you can. Not only Chinese celebrate it, Korean, Vietnamese, Tibetan, and Mongolian also celebrate this New Year. Since it is based on Lunar Calendar, therefore it is called Lunar New Year, but still commonly known as Chinese New Year. Usually during celebration such as Christmas, New Year and Lunar New Year, most people will send sms/text to friends and relative to wish them, but in some countries sms/text is not cheap, especially if you need to send more than hundreds of them. Last time there was a few websites that provide free sms service, but not to all countries. Recently I found one that still providing this service. And it is really reliable after I tested a few times. I found out this service from it's Android apps when I playing with BlueStacks. Introducing Pinger. Sending a testing sms/text to my own phone. The sms/text appear in my HTC Elfin in a few seconds only, I am in Malaysia by the way. For iOS and Android, install the apps from AppStore/Market. For Windows/Linux, go directly to the website. 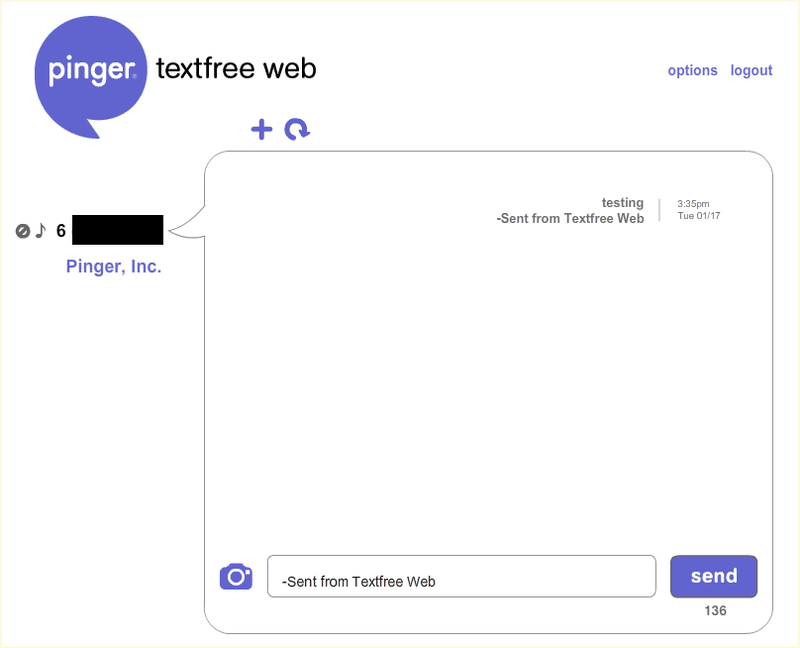 After that, Pinger will give you a list of phone number for you to choose, pick wisely, because you cannot change it later. It will ask your permission to share with your facebook friends, you can skip by clicking "cancel". Then you can start sending text. The number is based on International Direct Dial code. For smartphone (iOS and Android), try to use wifi as much as possible. Since it is free service, you will have to "enjoy" some advertisement. Happy Lunar New Year! Today is the first day of Water Dragon Lunar New Year. However if SOPA being implemented, we might not getting website service like youtube and wiki. It will be an ice age of Internet. If SOPA being implemented, meaning you will not able to see any of this kind of video available at youtube and I will not able to write any waste time post anymore, sigh. Btw, Megaupload has been shutdown by FBI, and SOPA was not even being use for the shutdown. Chinese New Year or Lunar New Year is always about family reunion, this TV commercial is from Malaysian National Petroleum company, talking about reunion. Drive safe for those that driving. Warning: this website that I going to introduce is not for replacing the real doctors. It can acts as a second opinion or reference for medical students. I found this website from some other blogs. Don't ask which one, because I read more than 100 blogs (weekly, not daily! ), lost track of which one that I found it. At the end of diagnose, there will be some results with picture and explanation. Then recommended actions, such as hospital or specialist or just some doctor. There are also some recommendation of what can be done at home to take care of the symptom or injury or disease. 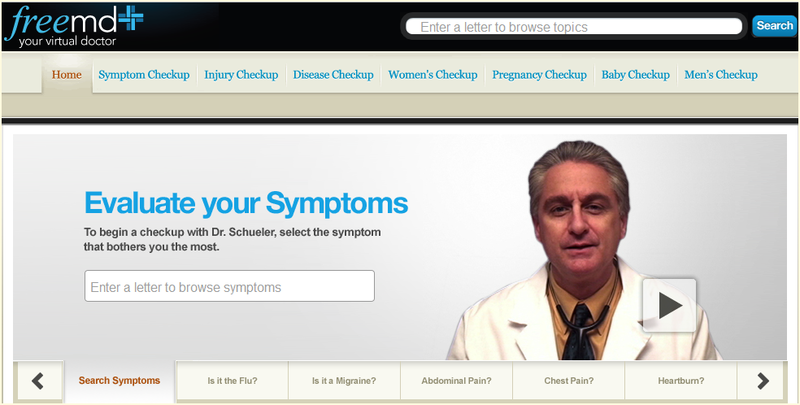 Finally there is a report of the diagnose that you can copy and send to your doctor. As I said it cannot be replacing the real doctor, just for second opinion. source: I wrote this article! What do Queen and Beatles have in common? Yes, they are famous people, but what else? Both of them sang "Fat Bottomed Girls Come Together" before. But did they sing it together physically? No. But how did they have this video? This video is made by a Dutch mashup artist, MadMixMustang. He not only mix the video, he also blended the sounds, which sounds like both Queen and Beatles are singing the song together. I got my solution on how to extract mkv from this website as well. source: I wrote this. Video is from YouTube. There was a lot of rumors and news about iPad3. Today I read somewhere that iPad3 will be LTE compatible. Why on iPad3 first before iPhone5? Because LTE is battery juice sucker, putting it on iPad3 first is a better choice before they can manage it on iPhone. Or maybe leaking photos from suppliers of iPad3. source: WWW for the news and I wrote the rest of this post, hahah! Available on Jan 20, a few days before the Lunar New Year. Even though PVC has been slowly remove from certain parts of the world, it is still popular in many developing countries, because it is very cheap to manufacture and many other politically advantages. If you have notice, he has his faux-twin to play with him. Meaning not a real twin, but using video editing software to combine 2 separate video files into one and sort of create a twin for himself. There are a lot of powerful software out there that can do this thing, let me do some planning to write something about free video editing software. Stay tune! Recently I found another file recovery software, and yes, it is free. Recuva is made by the same company that made CCleaner. I used to use CCleaner a lot on older systems to make sure they are working as good as the new system. No need to talk again about the file recovery on this software. But I wanted to point out that it can display the files that it can recover in different modes: tree view, file list view and best of all, thumbnail view. Anyway, to completely remove a file from your harddisk, memory card or thumb drive, use this, all of these file recovery software should not able to recover it. Here is a list of other file recover software and they are free. One thing to note: if you want to have a better chance of recovering file that you deleted accidentally, do not do anything (copy file, save file, download file, shutdown, etc), because the empty space that being use by the file you just deleted might be overwritten with new data. So make sure you have Recuva or other file recovery software ready in your PC/laptop. Windows7 flaw or network driver error? Something wrong with my network card or Windows 7 or network driver. 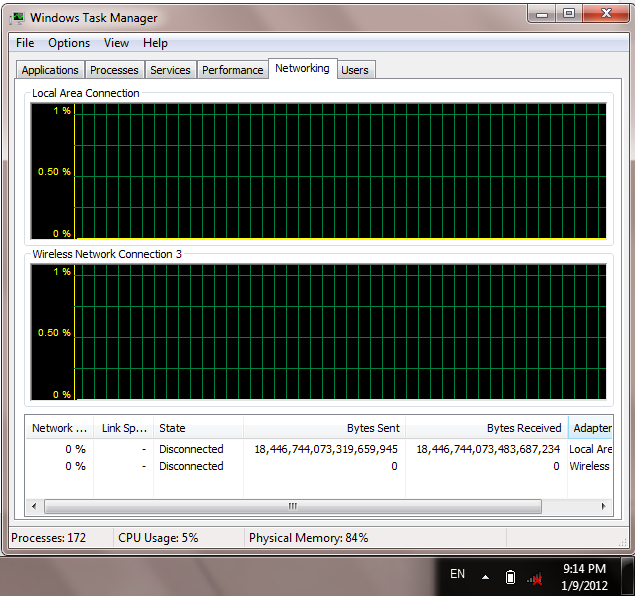 Sometime I like to check Task Manager just to make sure my network is working. Or at least to make sure I am fully utilizing the broadband unlimited download. Even though it is a very slow broadband, 512k, yes, not even 1M, but at full speed, theoretically I can download 5G plus of files in one full day. Of course it is not always that case, but nevertheless, usually I can get about 3 to 4G of download in just 24 hours. Get it? No photoshop being use here, it is being cut from print screen only using IrfanView. 16.38 petabytes of data has been flow in and out through the network card, how is that possible? Is that possible? I would think it is just Windows 7 flaw or driver problem. What do you think? Have you seen this before on your PC? Recently I watched a youtube video which supposedly sang by an artist called Jason D Chen from California. It is a Chinese song adapted from some English songs. 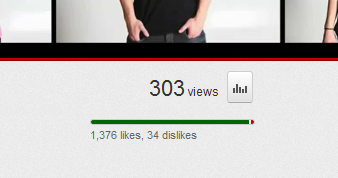 The singing was okay, but I can't helped to notice that the "likes" is more than "views". Is that possible? Can YouTube visitors "like" the video without "view" it? Could YouTube being manipulated? Or I am just too sensitive or outdated? These few days a lot of tech companies have been busy showing off their latest and concept gadgets at CES 2012 at Las Vegas. BlueStacks is one of them. They are showing off BlueStacks on Windows 8. The promo video below showed that after a new android apps being install on BlueStacks on Windows 8, an shortcut will appear automatically on the metro GUI. I was messing around with JoliCloud on the other day and found this website. 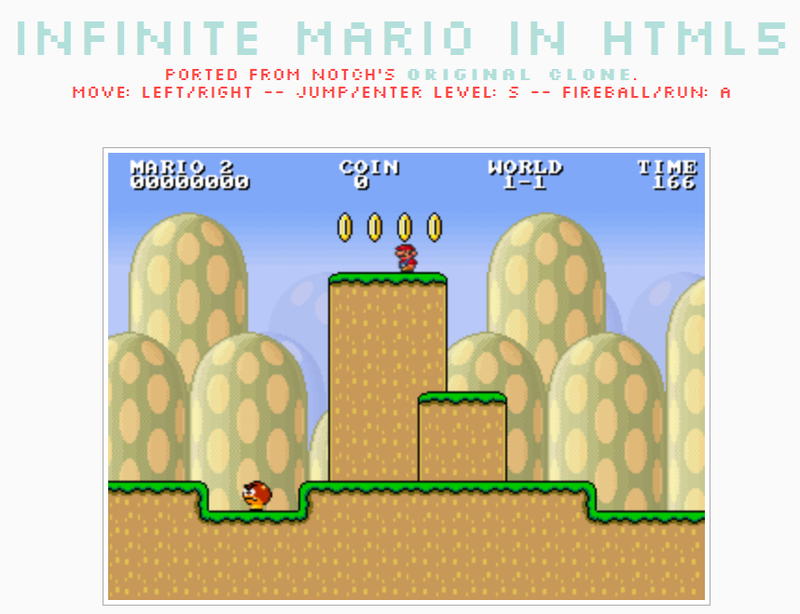 The author of this webpage converted Mario from somewhere else into HTML5, probably the original game is in flash. Mario is a never dying casual game, man and woman from 3 to 93 years old also like it (or hate it) somehow, either on Nintendo, to flash on internet, to iPad/iPhone apps, at some point of their life. I tried it on Chrome (rev 16), FireFox 8.0 and FireFox 9.0.1, all of them no problem with this HTML5. However IE8 unable to support it. Would you buy a PC that just the size of a credit card (thicker than credit card of course!) and it only cost you 25 dollar? Yes, 25 US Dollar. Better still, this PC can connect to TV/monitor/other display via USB2.0 or HDMI, capable of playing Quake and 1080p HD video. I don't mind to try it out. 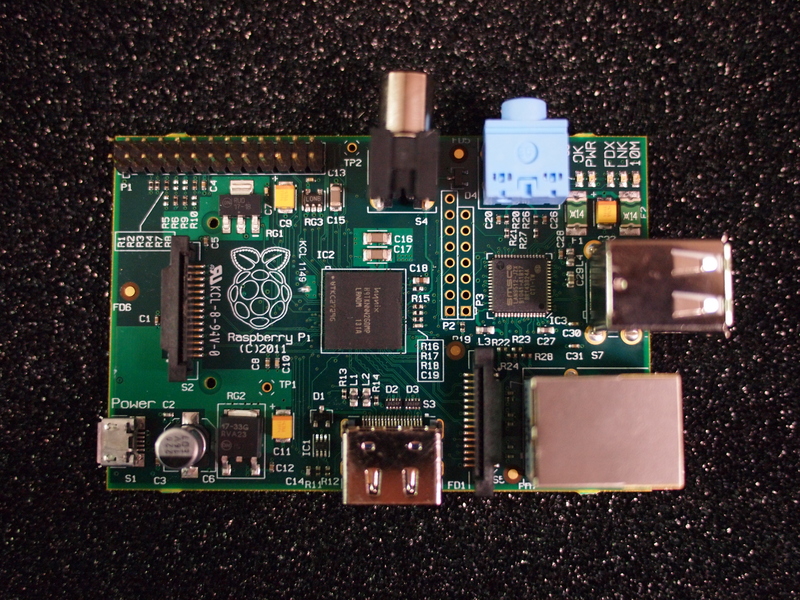 Raspberry Pi (Pi is π ) is being developed by a NGO which is called Raspberry Pi. Got you, haha. Anyway, back to the topic. This ultra-low-cost PC recently won an award at ARM TechCon, which aim to solve most of the costly PC problem in this world (sort of). They are not selling the PC for making profit, all the money being put back into the business. 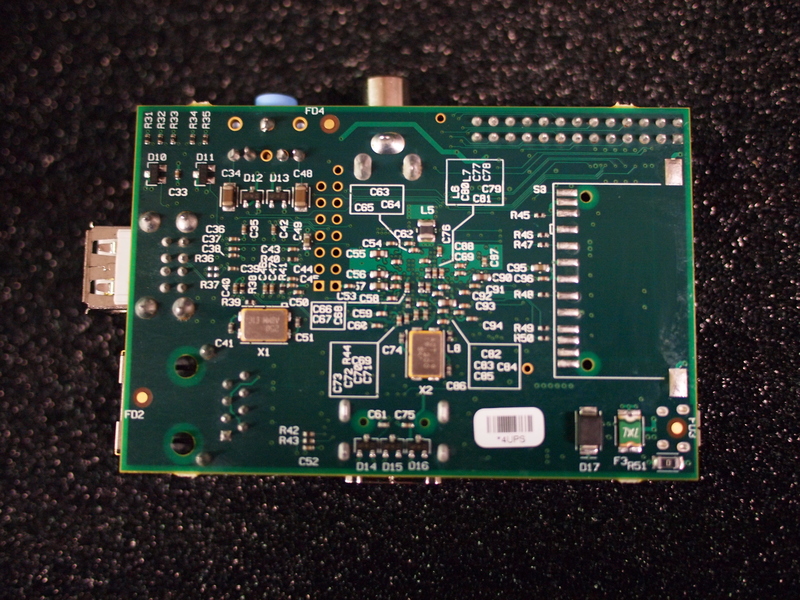 And they don't mind other copy the design with hope that everyone and every company could develop clone of Raspberry Pi. Personally I would think this is a very good product for education since conventional PC until nowadays still more than 100 dollar. If going forward all school can get this Raspberry Pi or clone with cost less than 25 dollar, more school kids can benefit from that. Someone (yes, someone) has posted side-by-side comparison of iPhone4, Nokia Lumia 800 and iPhone 4S. I don't want to look at iPhone4 because it is on iOS4, make no-sense whatsoever to compare iOS4. Looks like Nokia Lumia 800 WP7.5 is slower then iPhone4S, in most of the tests, but bear in mind that iPhone 4S is on dual-core processors, while Nokia Lumia is on single core processors. Don't think this is useful when someone is considering to buy iPhone or WP7, unless he/she is very geeky. :D Therefore I categorized this post as waste time posts. btw, I don't know why on the earth they put the music on this video, the finger gesture apparently showed that the person who did this video is talking about the comparison/result. I posted PS Vita Unboxing few weeks ago, and now to see what is inside of PS Vita, hence PS Vita Teardwon. This round of teardown is not from iFixIt, but from UBM TechInsights. Recently I wanted to install JoliCloud on Chrome, so I go to the JoliCloud page on Chrome Web Store, and click the "+ ADD TO CHROME" button, the button changed to "CHECKING..." and there is a pop-up asking for confirmation, I clicked on "Install" button to proceed. However nothing happen after I clicked the "Install" button. I keep on waiting and waiting and waiting for quite a while. So I quite the page and try again, and it showed that "+ ADD TO CHROME" again, meaning the apps was not being installed. How could this happen? So I go to ask Google, and after some trial and error on a few solutions being offered by nice people out there, finally I found the solution and it is very easy. 1. Go to My Documents. 2. Create a new folder or directory called "Downloads" (without the double quote). No restart PC/Windows is needed. I have confirmed this again by removing the "Downloads" directory and I cannot install apps on Chrome again. This solution is for Windows (XP until 7) only, I am not yet confirm for Mac. When the Downloads folder is missing from My Documents, it keep on waiting for the folder to be created. As soon as the folder being created, it can proceed. I checked on the folder during downloading the crx (Chrome apps file format), the crx has to be downloaded into the Downloads before being install into Chrome and the crx will be remove after installation completed. Obviously this is something that Google Chrome engineers should fix it in seconds. 2. Switch the Apps if you always using "Most visited"
4. On top right, click on the setting button next to your google login name (usually an email). p/s: I removed that Downloads folder at first place during hard disk clean up, thinking that this folder have no use since I changed Chrome default download folder to somewhere else. Intel AppUp is giving away Angry Birds Rio for Windows for free! Limited period only, until January 15 (or while supplies last). I am not sure what this mean, software is just a soft copied, it can be download unlimited time right? Probably they have limited number of downloads. Anyway, this is for new registration only. So this is too bad for me, because I already got my Angry Birds Rio for Windows for free back in September last year. Intel AppUp also added Chicken Invaders 4 Christmas as the freebie for new registration. Meaning you get US$11.99 worth of games for free! Intel AppUp recently have being revamped and it looks much better than old version. One of the reason is to make sure Ultrabooks users also have a good user experience with AppUp. The old version of AppUp was actually created for netbook segment, however other Windows based PC also can use it. 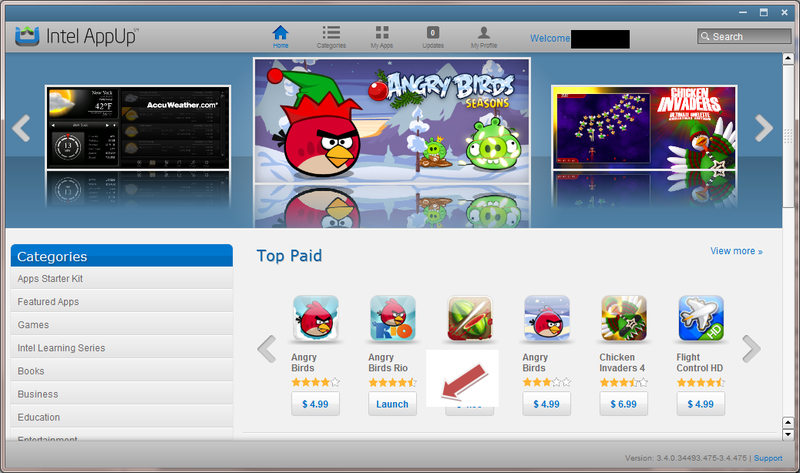 The red arrow in picture below showing I already have Angry Birds Rio installed. The best part about Intel AppUp is I can retain the free software for very long time. Even though I changed to new laptop, I still can download and install the Angry Birds Rio from AppUp for free on new laptop, as long as I use the same user id on AppUp. Another good thing about AppUp is you can try the software for 24 hours before you decide to buy or not. This is very good because you don't need to go through all the process just to get refund in case you find out you don't like the software. What kind of Facebook Friends you have? Friends on Facebook. There are really good friends, there are annoying friends who you wish you never accepted. See what kind of Facebook Friends you would have. I have 9 out of 10 listed here, sigh. Like this if you are FB user and you think this post is useful/funny. The button is at top right of content of this post. File-server services always being linked to piracy. A lot of songs, video, apk (Android setup file), software, PDF that supposedly need to be pay first before download legally from the original or authorized websites, but they are being cracked and put in to file-server and share publicly and the link being distribute worldwide. File-server actually being serve as temporary storage to send huge files for research and development in many area, from universities to private sectors. Some of us need to download homework or huge result files from file-server that being upload by a friend at another side of the planet. Of course it is convenient to download directly using web browser, it is good for small file, but for huge file like a few GB, there is no way we can wait for days for the download to complete. Furthermore, some web browsers will time out, so we have to start the download all over again. So some nice people out there wrote some nice softwares for us to manage these download, example MiPony and JDownloader. We can put all the links to the files we want to download and let the software manage them. However the captcha still has to be key-in manually by human (a.k.a. us). If your counterpart at Brazil uploaded 100 files, then you have to key-in 100 times the captcha and not once, but every time before the download begin on each file. We should be focusing on our the real work, not on downloading. So Captcha.Trader come to the picture. I can download the Captcha.Trader plugins and then add into JDownloader and MiPony, so that Captcha.Trader will solve the captcha for me. You can either buy some credits or start resolve some captcha and earn credits before you want to use it for download purpose. Captcha.Trader also works for Android (CaptchaDroid), WP7 (CaptchaToGo), and iOS (MobiCaptcha). Okay, enough of non-sense. I have been using Google Chinese Input as alternative for default Chinese Input from Microsoft. As a known fact, MS's stuffs simply okay only, if you want something better, you have to find another software, hence Google Chinese Input. Since I was grown up in China's PinYin system (Malaysia Chinese Education system uses PinYin system, so as Singapore), I am too used to PinYin system. Google Chinese Input is actually Google PinYin Input System. The most important feature of Google PinYin Input System is that I can key-in only first character of PinYin of the Chinese phrase (usually from 2 to 4 Chinese characters, sometimes more than that), it will show me the right Chinese phrase. This is super fast compare to MS Chinese input. Google Chinese Input has been there for few years, recently I noticed that Google Chinese Input have released version 3. Actually the latest version was on Jan 2011, boy, I am really outdated. :P Even though the software is not updated so frequent, the dictionary is being updated weekly, if not daily. What so special about version 3? It included an offline English to Chinese dictionary. That is the dictionary that I mentioned in paragraph above. This is very useful for English educated people that start to learn Chinese or people like me which has been away from Chinese for too long. When you switch on Google Chinese Input, if you press "shift" key once, it will allow you to type in English directly, press "shift" again, it will go back to detect PinYin input. While writing English, it will start translate the English to Chinese. Even I have problem spell an English word, it will try to suggest the correct answer. It will also suggests synonym of the English word. More synonym can be find in another tab. You can turn this feature off in setting if you find it annoying or no use for you. Set your preference on how many characters you key-in before Google Chinese Input start to suggest. I would think PhotoCap can replace PhotoShop for personal usage and/or family usage. Normally we don't need super special features that being use by professional. Features that we usually use are layers and filters, lighting or exposure, or maybe just red eye remover. PhotoCap is like the primary level of PhotoShop, all basic functions of PhotoShop are available on PhotoCap. I did try PhotoShop on my computer last year, but at the end it just waste the time to download, install and use it. I go back to GIMP, or most of the time I just use Irfanview if no fancy editing is required. Create poker cards: import 52 pictures and you have your new set of poker cards. PhotoCap is free for personal use or for educational usage. It will cost 1000 Taiwan Dollars or about US$33 (at exchange rate on Jan 1, 2012) for commercial usage. It still consider super cheap compare to Photoshop CS5 that selling at US$650 on Amazon. The setup file is 13.6MB, but main execution file is 1.9MB only, the rest are plug-ins or add-ons. source: I wrote and also translate some from PhotoCap website. Happy New Year Everyone! By the time this post is out in public, most of the countries in Eastern Hemisphere are in 2012, while the rest of countries are still in 2011. The service (or a product??) that I want to introduce to you is Captcha.Trader. Let's understand Captcha first. Captcha has been widely use in file-server services, to prevent machine/robot or automatic scripts being use to occupied all the download bandwidth. Captcha also being use on some website to prevent spam comments by robot/scripts. Captcha.Trader can be use in JDownloader and MiPony to help to automatically resolve captcha. I will cover JDownloader and Mipony in future post(s). Captcha.Trader also available for Android, WP7 and iOS! 1. We open an account at Captcha.Trader. 2. We earn credits by solving captcha for Captcha.Trader. Captcha.Trader will give us the captcha and we type the answer into Captcha.Trader. 3. Captcha.Trader allow us to cash the credit. 100 Captcha.Trader credit is equivalent to 1 cent (US Dolar). You can choose to cash out by Amazon gift card (minimum $5), or Paypal (minimum $2.50, or AlertPay (minimum $1). 1. Every captcha that Captcha.Trader send is around 20 to 30 seconds. Let's take 30 seconds as worst case. 2. Average users need 7 seconds to solve it. Let's take 10 seconds into calculation as worst case. 3. If a person work at home, in front of computer for 8 hours, he or she can key-in 720 captcha. 4. Usually one captcha worth 7 credits. So 5040 credits. 5. 5000 credits is worth $0.50. Looks small but by doing that for 20 days only, we can get around $10. Since we going to surf net and facebook-ing anyway, why not make use of the time to earn some extra money? Beside earning money, there is another good thing to have Captcha.Trader. I will write about it in future.